ST. LOUIS ROAD – “Kill Cops,” read a graffito on an overpass support. The graffiti-covered pillar was recently covered with swaths of gray paint, but this marking pen scar heralds what will no doubt be a systematic re-vandalizing of the surface. The stout column and the others holding up the link between L.K. Wood Boulevard and St. Louis Road, though utilitarian, form massive semi-arches to create a vast, cathedral-like space. It offers perfect camper habitat, sheltered from weather and accessible only by a winding trail on one side and the disused train tracks leading to Larson Park on the other. The clearing is bordered by a razor wire-topped fence enclosing Mad River Lumber on its south side, with a wooded area full of sinuous trails to its north. Though cleared of major debris Tuesday, May 24, on Wednesday the area was still strewn with litter and genuine toxic waste. 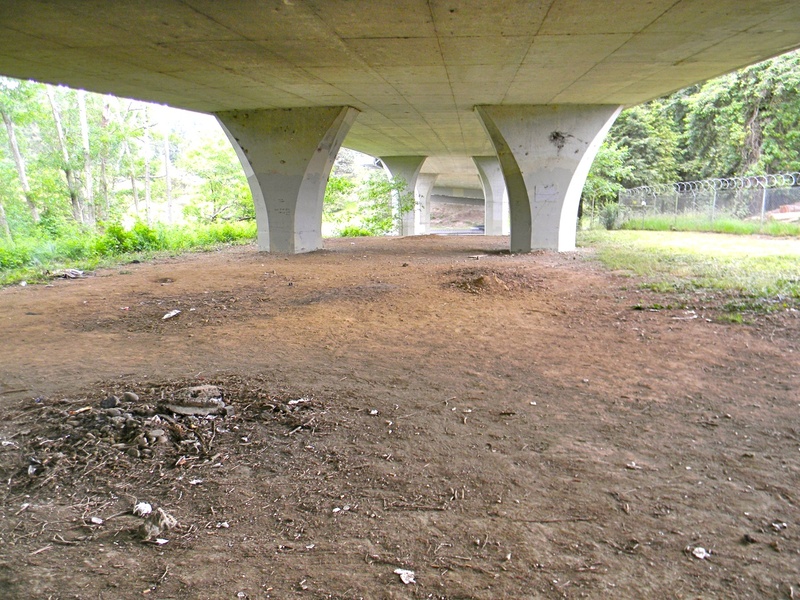 Half-burned batteries and plastic utensils lay shriveled at the edge of a well-used fire pit, a circular scorch mark blackening the overpass’s underside directly above. Smack in the middle of the trail leading down to the area, a human poo is topped by a bright yellow banana slug. The entire zone is coated with a grungy duff of cigarette butts, paper and plastic wrappers and other unidentifiable debris. 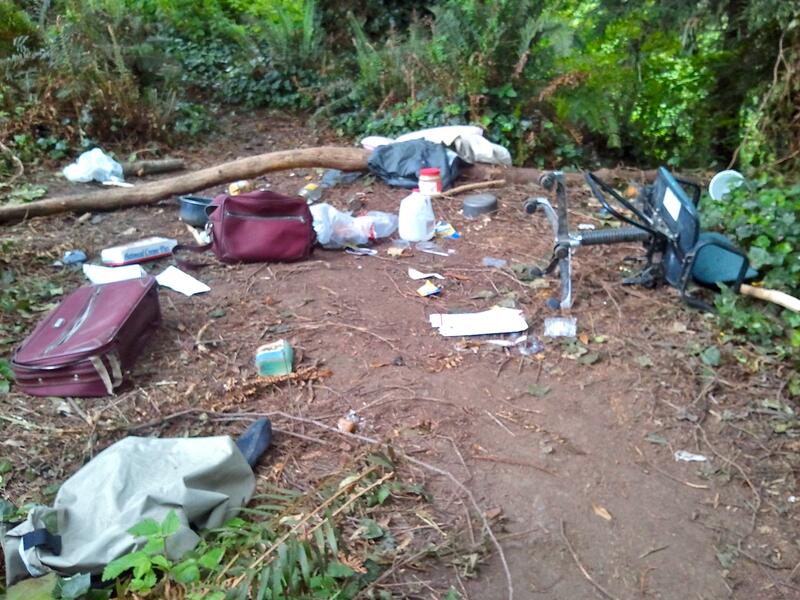 Though a continuing source of police calls for petty crime and camping, the area gained renewed attention last week because of the graffiti incident that took place there (see accompanying story, page 1). The remains of a tree ripped apart for firewood. After the arrests of suspects in the Monday incident, the sheer scope of the accumulated litter at the site compelled immediate attention. Tuesday, the City’s Environmental Services department descended, and with the help of inmates from the High Rock Conservation Camp, the area was cleared. But apparently one cleanup wasn’t enough. 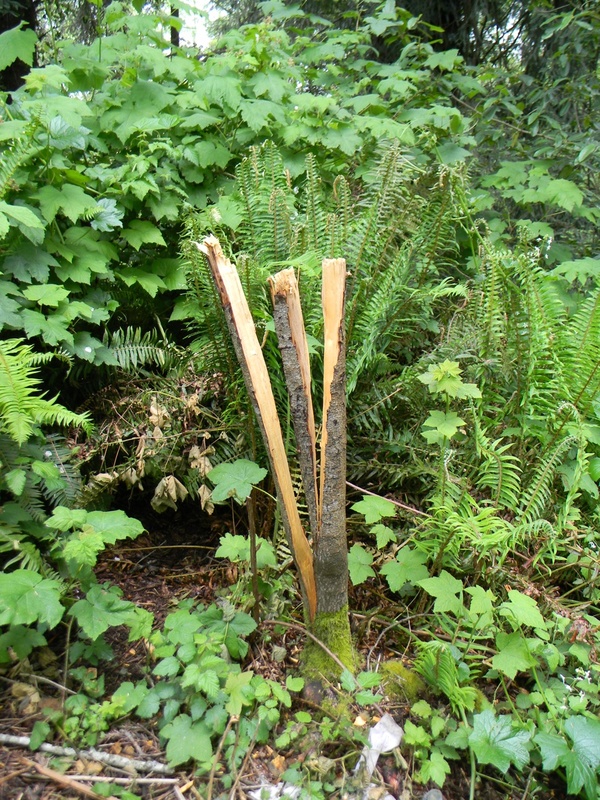 On a return visit Wednesday, Ranger Kevin Stonebarger was disappointed to find the area still befouled by copious waste and debris. Particularly Janes Creek, which was infested with all manner of unnatural items from tarps to an overturned shopping cart. 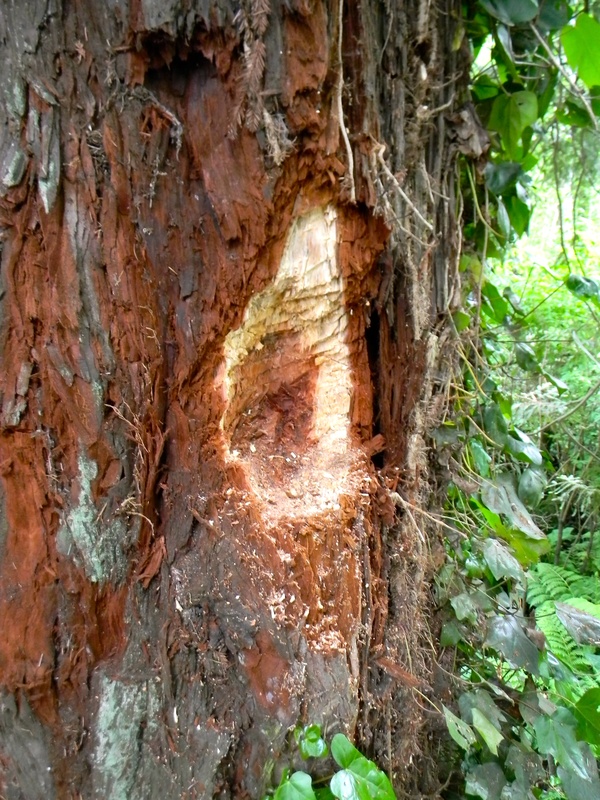 A big gouge was carved in the side of a redwood tree for reasons unknown. Thursday, City staffer Darius Damonte and five members of the Probationary Environmental Preservation Program (PEPP) crew, part of the Community School located in Eureka, returned for a do-over. Three cubic yards of waste were removed on the second go-round, including multiple rain-soaked sleeping bags and tarps, clothing, shoes, pots, pans, a TV set, an old Christmas tree and assorted books, newspapers and magazines. This entry was posted on Thursday, June 2nd, 2011 at 10:48 am	and is filed under News, Community. You can follow any responses to this entry through the RSS 2.0 feed.